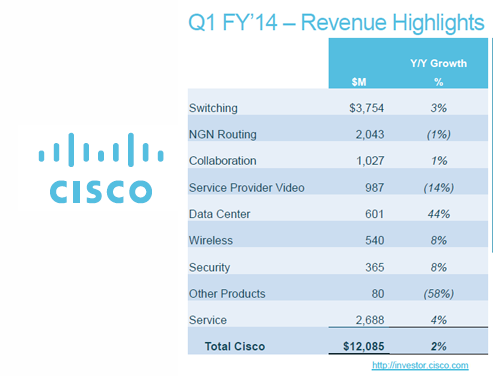 Cisco reported quarterly revenue of $12.1 billion, net income on a generally accepted accounting principles (GAAP) basis of $2.0 billion or $0.37 per share, and non-GAAP net income of $2.9 billion or $0.53 per share for its first fiscal quarter of FY14. 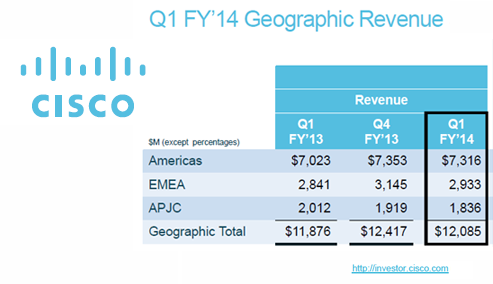 Revenue was up only 1.8% compared to $11.9 billion in Q1 FY13. Revenue and earnings per share were under industry analyst consensus estimates of $0.41 per share. Cisco cited pre-tax charges of $237 million related to the workforce reduction plan announced in August 2013, and a pre-tax charge of $257 million related to compensation expense in connection with Cisco's acquisition of the remaining interest in Insieme Networks. Cisco also warned that revenue would decline 8-10% this quarter (Q2) due to lower demand in certain countries, such as China, due to fallout from the NSA scandal. Service Provider orders also fell 13%. The order backlog is significantly weaker than expected. "While our revenue growth was below our expectation, our financials are strong, our strategy is strong and our innovation engine is executing extremely well. We remain confident in our long-term goal to be the #1 IT company in the world and help our customers solve their biggest business problems,” stated John Chambers, Cisco's CEO. Some notes from the quarterly conference call. The three areas of weakness are emerging markets, the Service Provider segment, and major switching/router product transitions. The switching business is stable and performing well. Data center products are hot. Wireless is performing well and the transition to 802.11ac is in its early stages. Meraki is performing well. NGN routing revenue is down. The first shipments of the new NCS platform occurred in the quarter. The new architecture of the NCS leads to a longer evaluation and sales cycle. The set-top box business declined 20% YoY. Cisco said it is committed to the segment, evolving its product line to the cloud, and walking away from deals that don't make sense. Sales in China continue to decline due to "political dynamics". Chambers attributed this to suspicion caused by fallout from the NSA scandal. Network encryption today is typically handled at the application layer with SSL or at the IP layer with IPsec. Building a more secure connection at a lower layer of the network has been a headache because encryption had to be provided on a link-by-link basis. 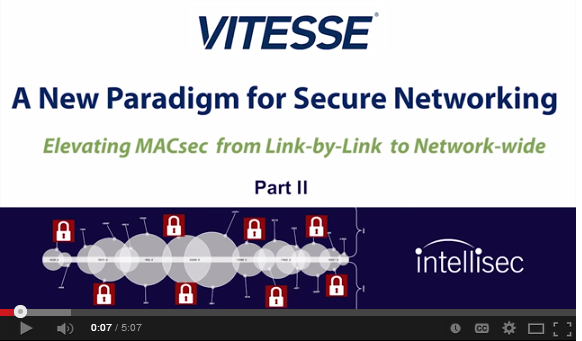 In this video, Vitesse Semiconductor's Sam Barnett discuses the timing and synchronization capabilities in Intellisec, a new technology that leverages MACsec protocol to extend security end-to-end. 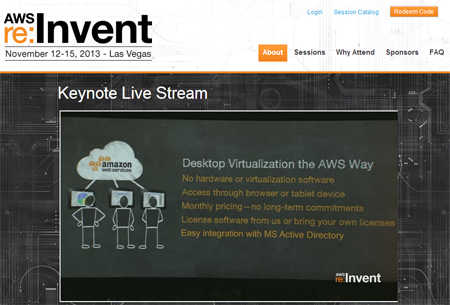 Amazon Web Services launched a virtual desktop in the cloud service. Amazon WorkSpaces provides a Windows 7 desktop with persistent storage and integrated with corporate active directories. Because it is a cloud service, all data is secured in the cloud and not at the user's location. Standard - 1 vCPU, 3.75 GiB of memory, and 50 GB of persistent user storage - $35 / user / month. Standard Plus - 1 vCPU, 3.75 GiB of memory, and 50 GB of persistent user storage - $50 / user / month. Performance - 1 vCPU, 3.75 GiB of memory, and 100 GB of persistent user storage - $60 / month. Performance Plus - 2 vCPU, 7.5 GiB of memory, and 100 GB of persistent user storage - $75 / month. All of the bundles include Adobe Reader, Adobe Flash, Firefox, Internet Explorer 9, 7-Zip, the Java Runtime Environment (JRE), and other utilities. The Standard and Performance Plus bundles also include Microsoft Office Professional and Trend Micro Worry-Free Business Security Services. WorkSpaces can also be accessed from iPads, Kindles, and Android tablets. DE-CIX, which operates the world’s largest Internet Exchange operator in Frankfurt am Main (Germany), has opened a new carrier and data center neutral Internet Exchange in New York City. DE-CIX employs a distributed model across multiple facilities. Initial DE-CIX sites for the new NYC exchange include key locations such as 60 Hudson Street, 111 8th Avenue, 32 Avenue of the Americas, 325 Hudson Street and 165 Halsey Street in Newark, New Jersey. Additional strategic sites across the region will be added in the near future. 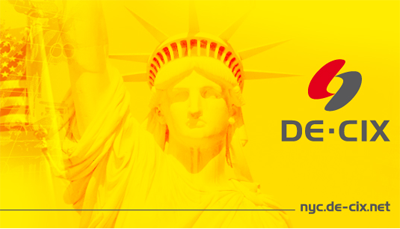 DE-CIX said its New York Exchange can support numerous Terabits per second of traffic based on its proven public peering model encompassing a high-capacity Ethernet infrastructure and an all-fiber metro optical backbone. The DE-CIX public peering model allows a service provider to pay for interconnection services on a per-port basis, rather than on the volume of traffic exchanged. This model provides for DE-CIX New York to lower operations and peering costs and offer best-in-class service. 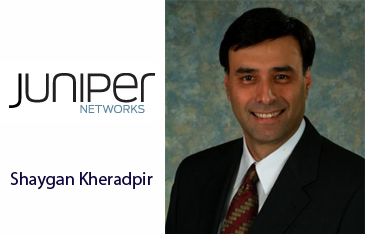 Juniper Networks named Shaygan Kheradpir as its CEO, effective January 1, 2014. Kheradpir succeeds Kevin Johnson, who in July announced his plan to retire as CEO. Johnson will remain as a member of the board. Kheradpir joins Juniper Networks from Barclays PLC, where he served as the chief operations and technology officer, and as a member of its executive committee. Prior to joining Barclays, he was executive vice president and chief information and technology officer at Verizon Communications. He holds a bachelor's, master's, and Ph.D. in electrical engineering from Cornell University. Xangati, a start-up based in San Jose, California, named S. "Sundi" Sundaresh as its new president and CEO. Xangati provides workload performance management dashboards for cloud and virtual desktop environments. Its solutions proactively track the health of key IT metrics that impact the performance of applications and users, accurately diagnose the cause of any performance bottleneck and recommend remedial action when a bottleneck is discovered. Customers include enterprises, government agencies, healthcare organizations, educational systems and cloud providers. 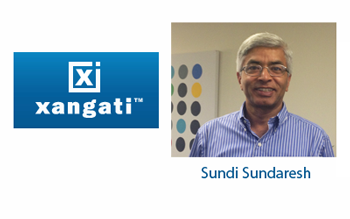 Sundaresh has served as an advisor to Xangati since early 2013. He has also served as advisor to numerous technology companies and as a board member of GridGain and SandForce. Previously, Sundaresh was the president and CEO of Adaptec, Candera (an enterprise storage virtualization) and Jetstream Communications (voice over broadband). Earlier this month, the company announced $11 million in new funding.